The first really cold day of winter and I'm in need of something hot and comforting. It's more than two years since I first queued at Good & Proper Tea's silver Citroen H van, parked up in south London, for a steaming hot cuppa. There were hot buttered crumpets too, with honey, marmite or jam for those in need. The sheer simplicity of a good and properly made cup of tea and a freshly made crumpet was such an obvious winner, I wondered why I'd never seen it done before. There are food and drink trucks all over London serving up everything from Pizzas and burgers to pork buns and gumbo. Personally, I can pass on 90% of them, but, when they really focus on what they do best, they are a glorious part of London life. 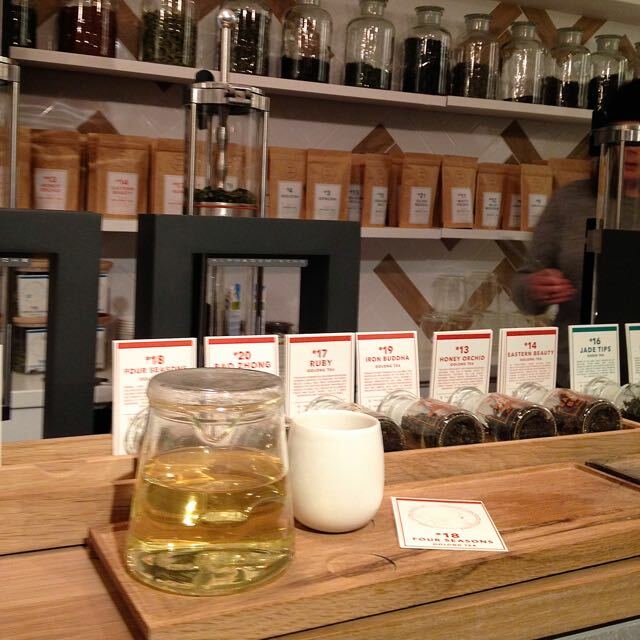 Good & Proper Tea is definitely in my top 10% category and, finding myself in Old Street, I headed straight for its first premises to refuel. It's not easy to find right now being in a not-quite-finished office development, but if you find yourself by Old Street roundabout it's worth seeking out. The space is small but functional. A long bar allows you to see all the teas on offer - a selection that has grown over the past couple of years and ranges from a strong Indian Assam black tea through a savoury Sencha to a tart, ruby-red infusion of Egyptian Hibiscus. You can take-away or, as I did, shelter from the cold on the single bench inside in the warmth. A delicate cup of fresh, floral Oolong was very welcome and, joyously, there are still crumpets for tea - now made with a sourdough starter and all the better for it. It's not at all compulsory but I confess I like to talk tea and Manager Ashley happily and knowledgeably obliges. I hear a second branch, in Soho, is planned. Somehow they've managed to keep the easy-going air of that Citroen van - which is still on the streets by the way, including south of the river at Brockley Market where I first encountered it. Good tea, properly made, and crumpets. I like Good & Proper Tea very much. What excites you for 2016?